The Zombie Chasers take to the high seas in the sixth installment of John Kloepfer's hysterical Zombie Chasers tween series, illustrated by David DeGrand. 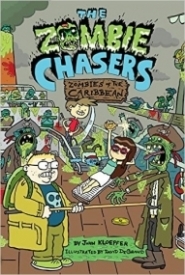 With all the middle school shenanigans, fast-paced adventure, and hilarious black-and-white drawings that have made this series so beloved by reluctant readers everywhere, The Zombie Chasers #6: Zombies of the Caribbean is a gore-larious romp not to be missed! Zack Clarke and his team—Zoe, Rice, Ozzie, Madison, and Olivia—have fled the infested coasts of Florida, chased by a ravenous mob of super zombies. With no antidote in sight, there's only one person who can help them now: an eccentric explorer—and renowned zombie expert—who's lying low in a zombie-proof bunker somewhere in the Caribbean. As the pals fend off decomposing pirates, crusty crew mates, and putrid sea creatures, they race to uncover the cure for zombies everywhere. But will they be able to defeat the zombies of the Caribbean before the cure and their plan go overboard? Now that Rice's addition of Spazola Energy Cola to the antidote has not only rezombified everyone but made them into Super Zombies, the crew must find a way to save everyone. Luckily, they have a boat and can sail around the Caribbean, hopefully avoiding most of the zombies. They look for scientist Nigel Black, and find him in a zombie proof fortress. He tells them that they need to find a frilled tiger shark and bring it back to him so he can work on an antidote. After much adventuring, the group does, but the zombie plague is not over yet-- the back of the book warns us that book seven will be The Zombie Chasers: Chews Your Own Adventure. Sadly, it's not: the last book in the series is World Zombination. Students LOVE this series. It's goofy and gross, and the cartoons of zombies with eyeballs popping out, people throwing up, etc. is part of the... charm. Lots of action/adventure and children saving the world. Also, a there is a cute dog. Unlike many series, this one keeps the readers' attention even after the third or fourth book. The length (barely over 200 pages) combined with plentiful illustrations and fast-paced narrative, makes this a book that doesn't take too long to finish. Combine that with the appeal of zombies, and this is a winner. While it is gory enough to please the most brain-hungry thirteen year old, it's goofy enough to not give younger readers nightmares. This is the perfect book to hand to a child who has just been told that The Walking Dead is not a show that is appropriate!